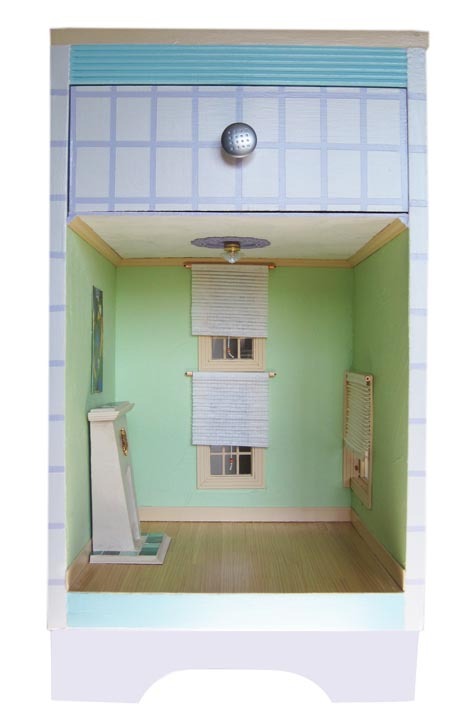 This 1/12 scale Miami Beach Doll house is really a side table with a working drawer. Reminiscent of 1930's Florida architecture, its bright pastel colours and sleek modern design is known as Art Deco. The high ceiling and open environment leaves plenty of room for great art on the high walls. The light fixture has an colourful cornice and pleated blinds cover the windows. The unique sandstone and marble fireplace has a golden sun embossed in the center. This tall fireplace gives a focal point to this room and the large windows let in lots of light. I will be posting newer pictures, different views and finishing touches to this house asap.